Wow! Thank you all very much. Thanks be to God, the provider of all. The Lutheran Youth Organization (LYO) of Martin Luther Lutheran Church (MLLC) had the greatest year ever for the Souper Bowl of Caring. After a final accounting of all gifts given our grand total is $907.00. That means we will be giving $453.50 to each of our chosen local hunger relief charities. $453.50 will be given to Fishes & Loaves in western Washington County, Texas. $453.50 will be given to A.M.E.N. (Area Ministries for Emergency Needs) in La Grange, the county seat of our own Fayette County, Texas. With these donations we can help these hunger relief agencies purchase food items to alleviate hunger in our community. In 2010 we collected $156.17. Thank you to all who made gifts of any amount to this special project. Thank you to the numerous youth who gave of their time to receive the donations. Wow! All we can say is, “Wow!” Thanks be to God and to the people of Martin Luther Lutheran Church of Carmine. In 2 short weeks we have easily overtaken our goal for the 2014 Souper Bowl of Caring. And we are not done yet. Week 1 we collected $223.00. Week 2 we collected $505.00. That is a grand total of $728.00 so far for local hunger relief. 100% of the donations will go to our two local food pantries: A.M.E.N. and Fishes & Loaves. You can still donate to this campaign this week. Please mail in or drop by your donations to the church office. We are very thankful for our wonderful youth who sponsor this each year. It has been great to see them holding the ‘Soup Pots’ after worship to receive these donations to help our neighbors in need. We are well on our way to our goal for the Souper Bowl of Caring in 2014. 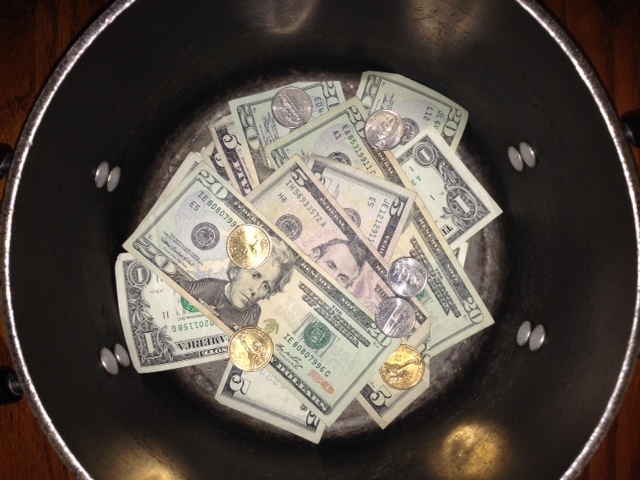 As of Sunday, January 26, 2014, we have collected $223.00 for local hunger relief. The Lutheran Youth Organization (LYO) of Martin Luther Lutheran Church thanks you for your generosity so far. Our goal is to meet or exceed last year’s total. In 2013 we collected $637.74. We are only $415.75 away from exceeding last year’s very successful year. Together we can help alleviate hunger in our community. If you will not be able to attend worship this Sunday, or you simply forget to bring something to give on those dates, feel free to drop by or mail your Souper Bowl of Caring gifts to the church office by February 9. Transform the time around the Super Bowl into the nation’s largest celebration of giving and serving. The Souper Bowl of Caring is an Annual Fund Raiser for the local food pantries. All proceeds will directly and exclusively support our local food pantries: Fishes and Loaves and A.M.E.N. The Lutheran Youth Organization (LYO) of Martin Luther Lutheran Church has led this effort for many years. Look for the LYO members holding the large soup pots after worship on the last weekend of January and the first weekend of February. Bring in monetary gifts for A.M.E.N. and Fishes and Loaves. Place these in the “Soup Pots” at the sanctuary entrances. For gifts placed in the Soup Pots, Cash or check accepted. Make checks payable to: MLLC LYO; memo line: Souper Bowl. No amount is too small or too large. You may give using a designation on your regular offering envelope – note: Souper Bowl. All gifts will be processed by the LYO and forwarded to the two recipient groups. If you will not be able to attend worship on the designated dates, or you simply forget to bring something to give on those dates, feel free to mail your Souper Bowl of Caring gifts to the church office by February 9. Our goal is to meet or exceed last year’s total. This is a nationwide effort. In 2013, $7,481,495 was generated by 8,118 groups across the USA!